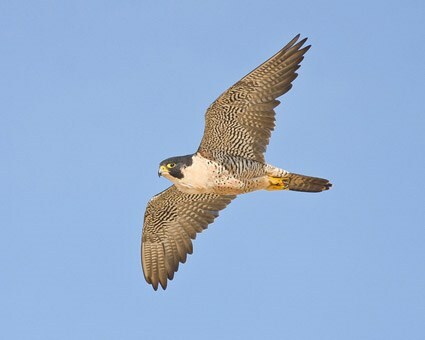 Peregrine falcon which is a large crow shaped falcon is the fastest bird in the world with a maximum recorded air speed of 389 Km/hr . It mostly feeds on medium sized birds and lives around mountain ranges , valleys and coastlines and even in cities . Its lifespan is 15.5 years . It is found everywhere on earth excluding polar regions and the arctic. Due to the widespread use of DDT it became an endangered species in many areas but after the ban on DDT populations of the species have recovered . I still can't differentiate falcon, hawk and vulture. LOL.. not my subject.